The aerosol industry is our only industry. Our total focus and commitment is on development and production of the most competitive aerosol filling equipment. In addition, AERQ-ROUGE gives you the advantage of pneumatic controls, with all its filling equipment running off air, rather than electricity. This makes it adaptable to a wide variety of working environments and safe to operate. Comprehensive quality control, with 90% of Aero-Rouge manufacturing done in-house. All machine are pre-assembled and tested before shipping to assure easy installation and problem-free operation and maintenance in our customers' facilities. We also maintain a nachine shop to repeatedly produce intricate parts - thus assuring consistent quality and a large inventory of parts. Although we are considered to be a small Private Company, we have focus our services to meet our customers requirements for today's more demanding Aerosol Filling. The AERO-ROUGE ART range is a simple to operate, reliable and accurate filling machine, designed to combine high production with short changeover time and easy maintenance. It is ideal for short production runs and awkward container shapes. The cost of the equipment in relation to its performance make it extremely economical and profitable to the user. The full range of ART head are available on the unit. These may be mounted on an attractive combined bench with central controls and easy access pneumatics, or fitted on individual bases. The basic ART range is supplied with one product filling, one crimping unit, one propellent filler and propellent pump. The machine is semi automatic, the filling cycle being initiated by a poppet valve controlled. Up to 1000 aerosol containers per hour may be filled with two operators. The basic machine may be expanded at a later date to increase output by simply adding a Rotary Index unit to the production line. 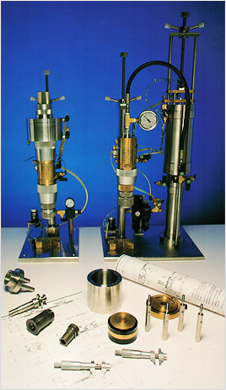 Many extras are available to suit your special requirerrent for example, high pressure butane sweetening cylinders (MOLECULAR FILTER), PROPELLANT ACCUMULATOR, COMPRESSED GAS and C02 filling accessories are available. Please enquire for the particular equipment you require.